Well, no—the Green Party leader is in fact asking for a recount. Her campaign filed a lawsuit in U.S. District Court in Pennsylvania on Monday, deeming the state’s electoral system “a national disgrace.” The federal lawsuit comes on the heels of a state court’s ruling that the more than a hundred voters who had petitioned for a statewide recount must pay a $1 million bond—an “exorbitant, punitive fine that makes it virtually impossible to engage in the recount process,” which rises to the level of a constitutional violation, David Cobb, Stein’s campaign manager, said at the Monday press conference. This labyrinthine, incomprehensible, and impossibly burdensome election regime might make Kafka proud. But for ordinary voters, it is a disaster. In the 2016 presidential election, rife with foreign interference documented by American intelligence agencies and hacks of voter rolls in multiple states, voters deserve the truth. Were Pennsylvania votes counted accurately? That truth is not difficult to learn: simply count the paper ballots in optical scan districts, and permit forensic examination of the electronic voting systems in DRE districts. This can be done in days, by top experts, if necessary at the Stein campaign’s expense, under the supervision of election officials, and without endangering a single vote. A majority of machines voted for Donald Trump in Pennsylvania. But who did the people vote for? Absent this Court’s intervention, Pennsylvanians will never know that truth. 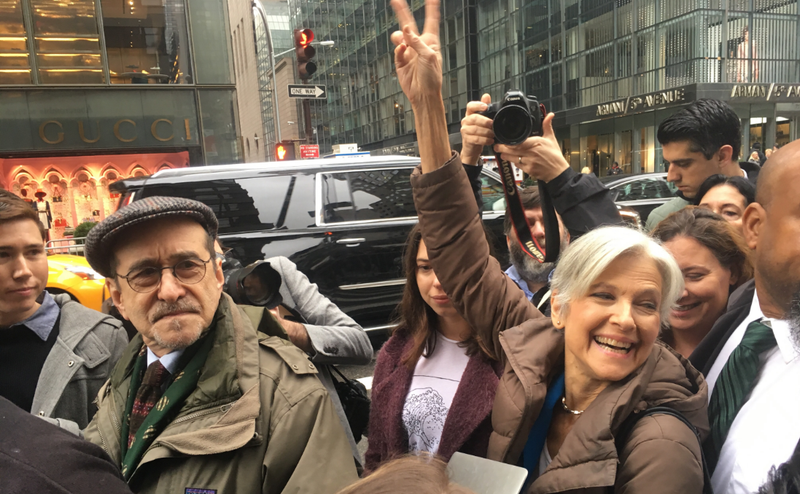 Elsewhere over the weekend, the Stein campaign and the recount effort won two major procedural victories: In Michigan, a federal judge ordered a statewide recount to proceed following a hearing on Sunday, rejecting the Republican attorney general and the Trump campaign’s lawyers’ arguments that it should be halted, and in Wisconsin, a federal court rejected a petition from several pro-Trump super PACs seeking to temporarily halt the ongoing, statewide recount there. Wisconsin: $3.5 million (paid) – additional $300,000 to be paid post recount. Essentially there was an accounting error on the state’s part and final total will be 3.8 million. “Stein is wasting taxpayer dollars,” said Ariel Kohane, who was wearing a yarmulke emblazoned with Trump’s face. A bit of a classic Manhattan character, Kohane has made previous appearances in the media as an anti-Beyoncé protestor and a Ted Cruz supporter. “How come you aren’t writing down anything that I’m saying?” he asked at one point, going on to complain about the effect that press conferences like Stein’s have on traffic around Trump Tower, as well as the extra security required in addition to the dozens of police officers that are now stationed around the president-elect’s home.